Veteran receivers Rob Bagg, Bakari Grant and Chad Owens won't be with the Saskatchewan Roughriders this season. The three were among Saskatchewan's final cuts, announced on Sunday. CFL teams had until 10 a.m. ET on Sunday to reduce their rosters to 46 active players. Both Bagg and Grant took to social media to say goodbye to Riders fans. "THANK YOU RIDER NATION,” Bagg tweeted. Grant said on his official Twitter account: "Thank you for one of the Most fun years of football Rider Nation! Every good thing must come to an end...#calilife." Teams must identify three quarterbacks and carry at least 21 Canadians. Clubs can also have up to 10 players on their practice rosters. The six-foot, 192-pound Bagg, a native of Kingston, Ont., spent nine seasons with Saskatchewan, earning a Grey Cup ring in 2013. Bagg had 364 career catches for 4,705 yards with 24 TDs in 139 career regular season games. 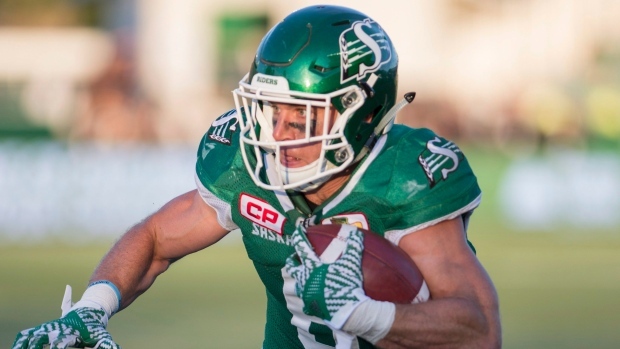 Grant, 30, registered career highs in catches (84) and yards (1,033) last year, his first with Saskatchewan. The six-foot-four, 205-pound Oakland native also spent time in the CFL with Hamilton and Calgary. Owens, 36, played just three games last season, recording 17 catches for 235 yards and a TD. He started training camp well but suffered a shoulder injury and didn't play in Saskatchewan's 39-12 exhibition loss to the Calgary Stampeders on Friday night. Owens, a nine-year CFL veteran, also spent time with Toronto and Hamilton. He helped the Argos win the Grey Cup in 2012 and was the league's outstanding player that season after amassing a record 3,863 all-purpose yards. In 2010, Owens claimed the John Agro Trophy as the CFL's top special-teams performer. Veteran defensive back Cauchy Muamba was among 12 players released by the B.C. Lions. The five-foot-11, 198-pound Muamba was in his second stint with B.C. after playing for the Winnipeg Blue Bombers and Edmonton Eskimos. Running back Ed Ilnicki, the 2017 Hec Crighton Trophy winner, was among nine players released by the Ottawa Redblacks. "Back to Edmonton. Thankful for what I learned through Ottawa's training camp and how I grew as a player. Journey continues," Ilnicki tweeted Saturday. Ilnicki ran for 31 yards on eight carries in Ottawa's 32-15 exhibition win over Toronto on Thursday night in Guelph, Ont. The five-foot-10, 220-pound Ilnicki, a native of Spruce grove, Alta., was attending Ottawa's training camp for the second straight year. The Redblacks selected the 22-year-old in the seventh round, No. 63 overall and after being released Ilnicki returned to Alberta to rush for 1,468 yards, setting a Canada West single-season rushing record while leading Canadian university football in rushing touchdowns (11) and carries (196). He helped Alberta (3-5) earn the fourth and final Canada West post-season berth before the Golden Bears dropped a 39-22 first-round decision to eventual division champion Calgary (7-1). The Winnipeg Blue Bombers released defensive lineman Faith Ekakitie, who they took first overall in the 2017 CFL draft out of Iowa. The six-foot-one, 292-pound Brampton, Ont., native played in 14 regular-season games, registering five tackles. Receiver Jonathan Epps was among 12 players released by Toronto. He had two catches for nine yards in the Argos' 32-15 exhibition loss to Ottawa on Thursday night.